It’s time for something new in athletics. DNA is an innovative way to engage younger audiences, which demand fast-paced entertainment and consume their sport content on multiple devices. It is also intended to provide attractive competition opportunities for all levels of participants – kids, club athletes and elite performers – that will strengthen the grassroots of our sport. Where does the name DNA come from? DNA stands for Dynamic New Athletics but the initials also highlight that this new format focuses on and respects the fundamental elements of the sport – running, jumping and throwing – and that athletics is in everybody’s genes. DNA is a rapid-fire, team-based, multi-event format for athletics. It features modified rules, mixed-gender relays and head-to-head competition in the field events where every jump and throw counts. It takes place inside a stadium but unlike a traditional athletics meeting, the focus in on just one event at a time. The carefully designed format means the action is non-stop and the final result will always be in doubt until the very end. With team success as the primary aim, the role of the coach during the event, tactics and team spirit are especially important. A whole DNA competition takes place in two hours – which makes it attractive both as entertainment and for participants in our modern, time-scarce age. DNA was created by European Athletics with support from the European Olympic Commit-tees. In a three-year project, we drew on research with young people around Europe, got extensive input from top athletes and then had event-presentation experts shape the product. Will DNA replace tradition athletics? No, definitely not. DNA is a parallel format that supplements traditional athletics like hip-hop supplements classical music. To maximise the fan base and participant base of athletics we need to offer both. Some people will like one, some will like the other . . . and some will like both! Will DNA replace the European Team Championships? No, the European Team Championships is an important event that is popular with athletes, broadcasters and sponsors around Europe. 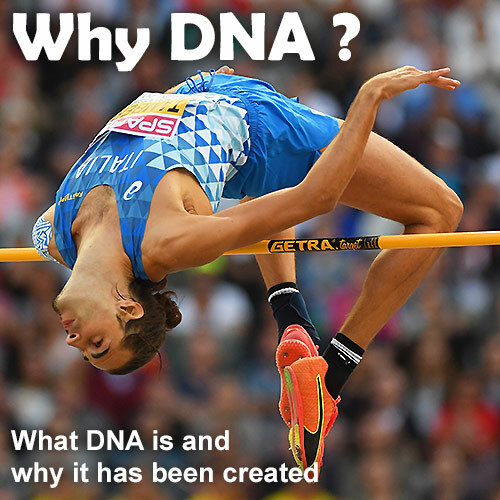 DNA is designed to be completely different and coexist with all existing European Athletics events. When will we see DNA in action? DNA will be officially unveiled at the 2019 European Games in Minsk when Europe’s top national teams of 8 women and 7 men will compete for gold medals in each of the 9 individual events and for the overall team title. It will be one of several innovative sport formats featured as the Games contribute to reshaping sport for the 21st century. Is there space in the calendar for DNA? The athletics year in 2019 is very unusual. Because the IAAF World Championships in Athletics in Doha take place in September/October, we have moved the European Athletics Team Championships to August. The European Games in June is an ideal time to focus attention on the unveiling of DNA. We have been careful to develop the powerful brand name of DNA so that in the future it is clear to fans and athletes at all levels that it and traditional athletics are different enough to coexist. What happens to DNA after the European Games? DNA is a work in progress and we expect the flexible format to keep developing as athletes of all levels try it out and audiences give us their reactions. Current plans are to introduce DNA at the national level across Europe and work with federations, clubs and other entities to implement it and promote further innovation.